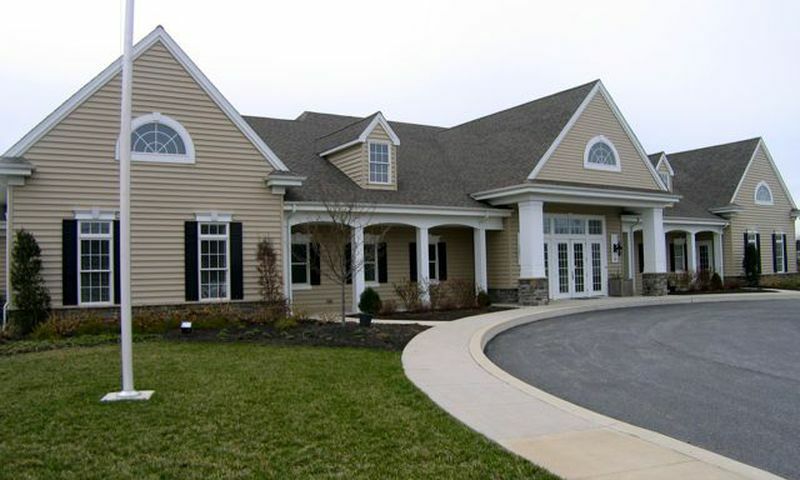 Situated three minutes from Garrison Lake Golf Course in Smyrna, Spring Meadow is an age-restricted community in Delaware s picturesque Brandywine Valley. Developed by Wilkinson Builders, this charming neighborhood is safe and pedestrian-friendly with bright street lights and wide sidewalks. Open space and wooded backdrops make Spring Meadow a scenic place to enjoy the mature phase of life. Buyers in this 55 and better community own their land in addition to their homes and pay low property taxes. Located near Route 1 and Route 13, Spring Meadow has convenient access to shore points. Sandy beaches and snow-covered mountain resorts in the vicinity provide a nice contrast of recreation options. On-site, Club Meadows is the vibrant clubhouse of this intimate neighborhood and provides attractions usually not seen in a community of smaller size. Residents can exercise in style at the state-of-the-art fitness center with yoga studio and juice bar. Social spaces include an amphitheater, billiards lounge, card rooms, and an arts and crafts studio. Outdoors, the grounds fully utilize available space with a heated pool, bocce courts, shuffleboard, and a putting green. Walking and biking trails wind throughout and are perfect for relaxing strolls and making new friends. Spring Meadow is a 246-home comprised of single-family and carriage homes, designed for energy-efficiency and comfort, with Amish framing in eight different floor plans. Resale homes have modified their floor plans, which range from 1,392 to 2,251 square feet. Interiors of these energy-efficient homes feature 9 ceilings on the first floors with two bedrooms and two bathrooms. Kitchens have 36 cabinets, garbage disposals, and appliance packages, including dishwashers. The designer bathrooms contain full-sized vanity mirrors and cultured marble tops. Some homes have side yards, and all feature a professionally designed landscaping package. Low-maintenance exteriors and energy-efficient features allow for worry-free living. The energy-saving features include 48-gallon electric water heaters, super sealant packages, energy conserving insulation, insulated glass, and infiltration barrier wrap on all exteriors. Residents of Spring Meadow in Smyrna enjoy a luxurious lifestyle surrounded by life's conveniences. The low-maintenance homes allow homeowners to focus on forming friendships and more time to enjoy their families. Social clubs are springing up and newcomers with fresh ideas are welcome. Existing clubs include walking club, Spring Meadow Golf League, journalism club, pairs bunco, and men s and ladies poker. Just around the corner, residents can play 18 rounds of golf at the Garrison Lake Golf Course. With a location just north of the state capital near Route 1 and Route 13, Spring Meadow offers convenient access to Philadelphia, Baltimore, Washington, and New York. Philadelphia s international airport is less than 45 minutes away. Dover can be reached in less than ten minutes and offers many opportunities for continuing education at Wesley College, Delaware Technical and Community College, or Delaware State University. Dover s cultural highlights include the Modern Maturity Center and the Schwartz Center. Owning a home within Spring Meadow in Smyrna, Delaware means never running out of things to do and places to visit. Club Meadows - 8,000 Sq. Ft. There are plenty of activities available in Spring Meadow. Here is a sample of some of the clubs, activities and classes offered here. There were four attached home floor plans built within Spring Meadow. These offer great low-maintenance living as resale options with 1,265 to 1,673 square feet of living space. Homebuyers can select a home that has two bedrooms, two bathrooms, and an attached garage. Homebuyers can choose from four different floor plans available on a resale only basis. While the standard models offer between 1,650 and 1,935 square feet with two bedrooms and two bathrooms, many homes throughout the years were build with customized options. Therefore sometimes you can find resale homes with an extra bedroom. Wilkinson Builders designed their homes for active adults with first-floor master suites and low-maintenance exteriors. Spring Meadow is located in Kent County Delaware just north of our state capital of Dover. The community sits on Route 13 and is a short distance to Route 1 so you have the ease of traveling to the shore points or north to Philadelphia. The community is well kept and the clubhouse offers a large variety of activities with a heated pool for your relaxation. Spring Meadow has a few townhomes and single family homes that are on the market for resale. Stop by and take a look around. 55places.com is not affiliated with the developer(s) or homeowners association of Spring Meadow. The information you submit is distributed to a 55places.com Partner Agent, who is a licensed real estate agent. The information regarding Spring Meadow has not been verified or approved by the developer or homeowners association. Please verify all information prior to purchasing. 55places.com is not responsible for any errors regarding the information displayed on this website.